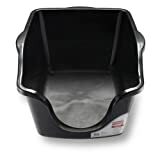 ferret litter boxThe product is High Sided Litter Box. Easy to use. The product is manufactured in China. Ferrets are very trainable and if you’re patient, you will find training them no more difficult than training a cat. The number one mistake most people make is assuming that ferrets are like cats and will naturally use the litter box. Ferrets are caged and separated from their mothers very early at ferret farms. There are several ways you can train your ferret to use a litter box. Ferrets all have their own personalities, so what might work for one ferret will not for another. Even blind ferrets can learn to use a litter box. If you let your ferret outside to play in the house, take a sponge or paper towel and wipe vanilla extract on the walls around the litter box. The ferret will smell the vanilla and will easily find the litter box. Unless there’s something seriously wrong with your ferret physically, a ferret won’t go to the bathroom in the same place where he eats, plays or sleeps. If it smells like his bed, your ferret won’t leave a mess there. As long as you’ve thoroughly cleaned the spot so it no longer smells like a bathroom, the ferret should not be tempted to go back. Get your ferret in the habit of going to the litter box first thing when he gets up. Wake him up while he is still in his hammock, and physically place him in the cage litter box. Your ferret will automatically relieve himself before venturing out of the cage, simply because it will become routine and feel natural to do so before exploring. The “Big Bed” method. This is Plan B, to be used when the first two methods have failed to prevent your ferret from going potty where he isn’t supposed to. If your ferret has the run of the house, you’ll want to have litter boxes in all the rooms where the ferret roams. The nicer the litter box experience is for your ferret, the fewer out-of-box experiences you’ll have to contend with. Take him/her to the litter box at once if you notice your ferret backing into a corner. Gradually increase the space the ferret can roam in once your ferret is using the litter box outside of the cage. In the cage, put in lots of blankets and towels around the box to clearly separate the bed and bathroom areas. Add more litter boxes as necessary as a ferret likely won’t go too far in search of a box. 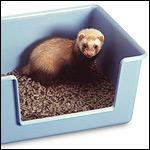 Keep ferret confined to cage with a litter box. Whenever the ferret uses the litter box, make sure he/she gets lots of praise and possibly a favorite treat, to help reinforce this behavior. Use a low walled litter box. You may also want to leave a little waste in the litter box to make it clear that it is the toilet area. As mentioned earlier, ferrets under stress may have temporary relapses in their litter box behavior. The introduction of a new pet into the household, too much smoke in the house or the loss of a companion, can affect a ferret’s state of mind and, consequently, his bathroom behavior. Place the ferret in the litter box before taking him out to play, and frequently take him to the litter box during play time. Never punish your ferret for mistakes. Gently place your ferret in the litter box if caught in the act, but this must be immediate to have the greatest effect. Observe your ferret to make sure he is using the box. Move the litter box to there if your ferret seems to prefer another area of the cage. Once your ferret is using the litter box in the cage, let him out of cage in a limited space, under close supervision. Place a second litter box outside of the cage in this space. Go back to the confinement or limited space with supervision stage and begin again if your ferret begins having accidents. Be flexible about the placement of litter boxes – if your ferret seems to prefer a particular place as a toilet, put a litter box there. Be patient and consistent, and expect a few accidents as ferrets usually don’t litter train perfectly all at once. Constant supervision, while ferret is out of the cage, will be necessary during the early stages. Place a litter box there and gradually move it out of the way if your ferret wants to use an inconvenient location. Ferrets are caged and separated from their mothers very early at ferret farms. Ferrets all have their own personalities, so what might work for one ferret will not for another. If your ferret has the run of the house, you’ll want to have litter boxes in all the rooms where the ferret roams. Unless there’s something seriously wrong with your ferret physically, a ferret won’t go to the bathroom in the same place where he eats, plays or sleeps. Even blind ferrets can learn to use a litter box. This entry was posted in Ferret Litter Tips, Uncategorized and tagged ferret litter training, ferret potty training, Nature's Miracle, P-82035 on May 17, 2017 by admin.